The colours of pumpkin skin also vary enormously. Start with every tint of orange, of course, from amber to apricot, coral to persimmon. Then envision inky black or ghostly white; buttercream or slate blue; sage green or darkest myrtle. Some favour even more outlandish hues: baby pink; mustard; salmon; shiny, fiery red. Some aren't content with a single shade at all, so they tart themselves up in stripes, mottles, marbling, and speckles, however Pumpkin comes I love it I also love hot and spicy food and one of my favourite cookbooks is Jeffrey Alford and Naomi Duguid’s Silky Coconut Pumpkin Soup from their book Hot Sour Salty Sweet. This recipe is modified from Jeffrey Alford and Naomi Duguid’s Silky Coconut Pumpkin Soup from their book Hot Sour Salty Sweet. 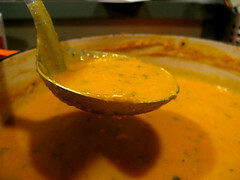 I like roast pumpkin for a soup as it gives a depth of flavour missing from the boiled pumpkin. Cut the pumpkin, then cut the peel off it and cut into chunky chunks and drizzle with olive oil and roast in a hot oven until cooked. In a heav pot, cook bacon on low heat until very crispy. Place cooked bacon on paper towels to drain. Pour off excess fat, leaving about 3 tablespoons in the pot. Add onions and shallots. Cook on medium heat until translucent and softened. Add garlic and cook another minute or two more. Stir in mashed pumpkin and cook until pumpkin is heated through. Add coconut milk, chicken broth, and parsley. Bring up to a gentle simmer.Partially blend the soup if you like chunks of pumpkin for texture, if not then purée it until silky smooth. Add spices, fish sauce, sugar, salt, and pepper. Gently simmer for 15 minutes or so to allow flavour to meld. Taste and re-season if needed. Serve soup with pieces of crumbled bacon on top.